First Kill... hope its the last, well its has not been the last. This looked like the best existing thread for this. Well Klaus got his first kill today. I think a mama squirrel. Poor thing. To be fair she has teased him since fall before she had babies.. so I'm not surprised. However I have no idea if her babies are old enough to be on their own or not. Or if it was a baby and not mom. Our neighbor has a tarp covering something that is leaning against our privacy fence and she seems to have a nest in there. I'm pretty sure I seen more than one squirrel walking around in their yard so they're not super young, but what if they still needed her? I'm thinking I should call someone to pick them up, not sure who. Might be a silly question but can Klaus get in trouble for getting a squirrel? Also, I didn't see any bites or scratches on him... so he should be good? Rabies was updated last month. My thoughts are that if Klaus got one, it was probably a kit (young squirrel). Unless he caught an adult completely off guard - fat chance! - he would have suffered damage, squirrel's can be vicious!! Animal law varies *greatly* grom area to area. My off the cuff answer would be that as long as they aren't pet squirrels then he's fine legally. However if they're protected and to my knowledge *none* are now but there was one (red/grey?) that was protected here in Texas and the fox squirrel was protected in the DelMarVa area until last year. (( I can't even straighten that sentence out! )) If they're protected *he* won't get in trouble but you might. If you don't see scratches / bites, just use common sense and watch for any you might have missed - but if it's a kit, he probably didn't get any. I don't know your laws but here in ny dogs are not supposed to "harass" wildlife. I would keep quiet. You do not know how your animal control will respond. Haley, no idea on everything, except for the rabies issue that you brought up.....from what I read squirrels are not rabies carriers, so they have to be bit by something, and the actual squirrel that could survive a bite from a rabid animal is slim. So that will put your mind at ease. Miya loves squirrels, but for the most part adults are way too clever, babies on the other hand....ugh....let's not talk about it. If you are worried about young your best bet is to poke around where you think the nest is. If you find them and they look weak, since at this point they will have been off the mother a while if that was the mom killed, then you can box them and find them a home with the conservation department usually. Just say the mama got hit on the road and you could hear the babies crying for a long while. If it's been very long and the babies are very young they could already be dead. I would do an inspection myself first and not bother to call someone in. If they are older they will run from you. If they have fur and move around readily then they are old enough to figure life out on their own but if they are lacking fur or not willing to run from the nest when you find them then they are too young to be alone. An eye dropper and esbilac is good to feed them until you can get them to the next person. Well by time I got home from work I didn't see any. Its on the other side of our privacy fence in our neighbors yard so I rattled the tarp really good and couldnt see or hear anything. They must have been old enough to leave. So thats a relief! He has been really obsessive about wanting to go outside now, and won't leave that spot. So hopefully after a couple days he calms down. I can't get him back in the house unless I take him out on a leash. 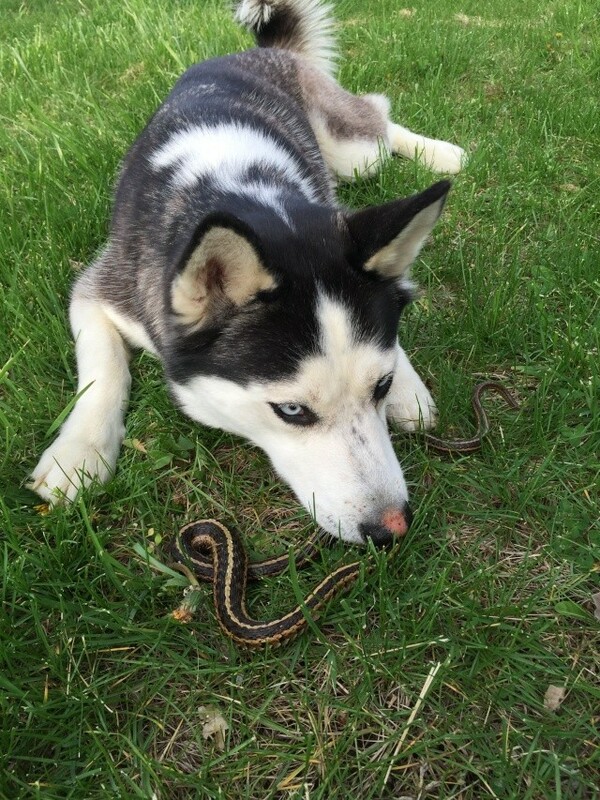 Suka is a snake killer! Nearly gives me a heart attack when she leaves one on the porch for me. She also catches mice, moles and birds....she is just so darn fast!! Subject: Re: First Kill... hope its the last, well its has not been the last.